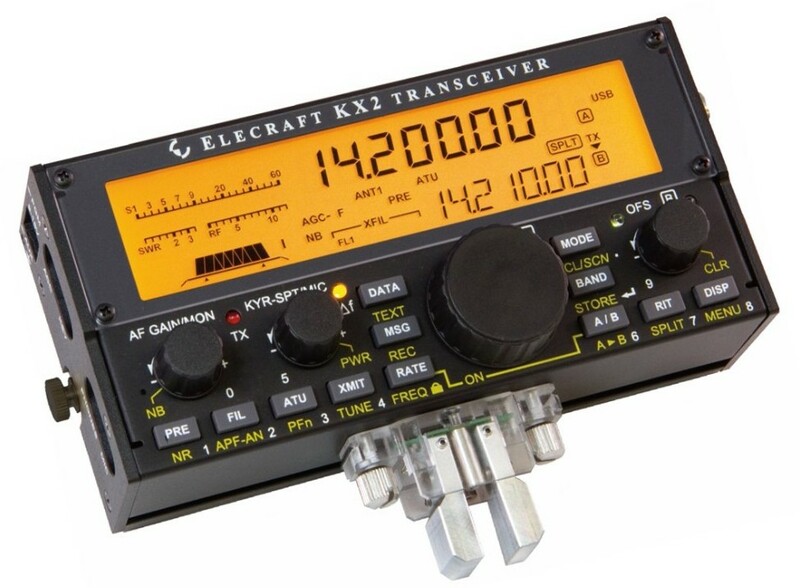 Our KX2 and KX3 transceivers have many standard features targeted specifically at SSB operation. Some are pretty much unheard of in other radios in this class. You can record and play back two 15 second DVR messages. These are especially useful during contests or SOTA operation, allowing you to store a CQ message, your call, or an exchange. To auto-repeat a played message, just hold the '1' or '2' switch rather than tap it. The auto-repeat interval can be set using the MSG RPT menu entry. Speech compression can add a lot of "punch" to your low-power signal, bringing up average voice power. As with the K3/K3S, our KX-line compression algorithm is exceptionally clean. Use the CMP switch on the KX3 (TX CMP menu entry on the KX2) to dial in compression of up to 30 dB. 8-band graphic equalizers (MENU:RX EQ and TX EQ) can be used to tailor the receive and transmit audio to your liking. 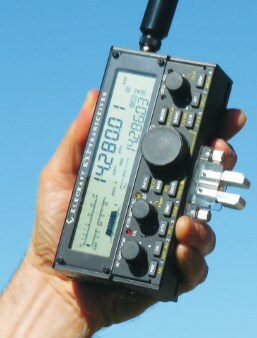 The KX2 is the world's smallest all-HF-band, all-mode "HT". Using the built-in mic, you can operate the KX2 like any handheld. Tap XMIT to transmit. When interference is heavy, you can often eliminate it by cutting the low or high end of the audio range. In SSB modes this low-cut/high-cut method is the default. Use the PBT I/II controls on the KX3, or tap FIL on the KX2 and use the two knobs above the switch. If a carrier (sometimes called a "tuner-upper") appears, you can use remove it using auto-notch. Hold the NTCH switch on the KX3, or hold APF-AN on the KX2. NR on the KX2 and KX3 can be adjusted using a single knob function, from completely a completely "dry" mix (no NR applied) to 100% "wet" (all NR). NR can relieve the fatigue of listening to weak signals on a noisy band. Many small transceivers don't provide this important feature. It is often called a "clarifier" because it allows you to tune in signals that are a bit off-frequency. The beauty of RIT is that it only changes your *receive* frequency, leaving your transmit frequency fixed. This is helpful if you're having a conversation with more than one station at a time, where each signal is a little off, such as on a net. The KX2 and KX3 are among very few radios that provide full stereo to the headphone jack. You can use this to advantage during normal operation by setting the AFX MD menu entry to "DELAY" -- this simulates stereo receive audio, giving voice signals a warm, rich sound. In dual watch mode (MENU:DUAL RX), you can listen to your VFO A and B frequencies at the same time, with VFO spacing wide enough to work most SSB DX stations operating split. Using the VFO CRS menu entry, you can select coarse VFO tuning steps independently for each operating mode. In SSB mode, your choices are 0.1, 0.5, 1.0, and 2.5 kHz per step. The default is 0.5 kHz. Bonus feature: If the OFS/VFO B knob is in the OFS setting (OFS LED lit), you can use the VFO B knob to move VFO A in coarse steps while leaving the VFO A knob itself set for fine steps (10 Hz). There are times when you can't quite complete an SSB QSO due to fading, and switching to CW has an advantage. With the CW-In-SSB feature turned on, you don't even have to change modes: just hit the key or keyer paddle and start sending. This feature is particularly useful on 6 meters with fleeting band openings. Many of have successfully completed (or initiated) a cross-mode QSO in this manner. To turn CW-in-SSB on, tap the PRE ('1') switch while in the CW WGHT menu entry. Just about any mic with a 1/8th (3 mm) plug can be used with the KX2 or KX3. To enhance versatility, you can turn mic bias on or off (MENU:MIC BIAS) and specify whether your mic has no switches, PTT only, or PTT and VFO UP/DN switches (like our model MH4). No PTT switch? Use VOX or the XMIT switch. This feature is missing from many small transceivers. It allows 100% hands-free operation for vehicle/bike/pedestrian mobile, or just for operating convenience with a headset/mic. You can turn VOX on/off, set the threshold, and dial in just the right amount of anti-VOX (VOX INH menu entry) to keep the speaker from triggering VOX. This feature is useful if you're operating in a very noisy environment. By adjusting the threshold (TX GATE menu entry), you can automatically cut transmit audio off when you're not speaking; that is, wind noise or other environmental sounds won't be heard at the receiving end. In answer to many private inquiries on the topic: An unboxed KX2 will fit in a stocking whose interior cross section approximates an ellipsoid 3.5" long and 2" wide (9 x 5 cm). An MH3 microphone and KXPD2 paddle inserted ahead of the KX2 will satisfactorily occupy an equilateral conic toe void with altitude of 4" (10 cm) or greater. Given the transceiver's maximum storage temperature of approx. 70 C, a standard decorative incendiary display may be employed beneath the stocking(s), though during initial testing at daybreak we recommend an operating position no less than 7' (2 m) from open flames. 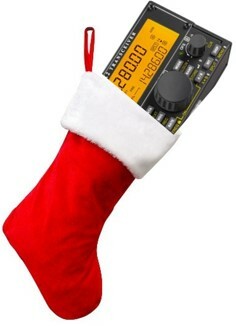 Additional advice on holiday package deployment is available from Elecraft Elf Services (sales@elecraft.com). Our staff is especially well versed in assisting covert gift purchasing activity by those only tangentially associated with ham radio. I have enjoyed my KX-2 for the last year or so and also have a K-3. I have the 2.89 firmware and cannot find the ESSB function like on the K-3 in the menu. I am not a ESSB fan, but if it is in there would like to see how it works.